If she says yes, Kitty will be Masked - surgically transformed into Lila Hart, the Prime Minister's niece, who died under mysterious circumstances. As a member of the Hart family, she will be famous. She will be adored. And for the first time, she will matter. There's only one catch. She must also stop the rebellion that Lila secretly fostered, the same one that got her killed, and one Kitty believes in. Faced with threats, conspiracies and a life that's not her own, she must decide which path to choose and learn how to become more than a pawn in a twisted game she's only beginning to understand. I received an e-arc through Netgallery for an honest review. 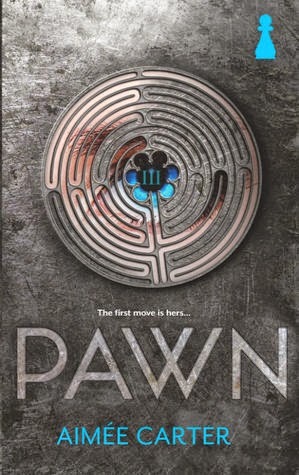 What can I say about Pawn, it was such an amazing, fresh, unpredictable story. I have read so much dystopian in the last couple of mouths but Aimee Carter took it on in a new way, but still keeping the somewhat fundamental’s of a dystopian novel, such as the way people are categories on certain things . In the world that Aimee created, you took at test on your 17th birthday, and from that test you are put into a group from 1 -7. This number was where you stood in society, what advantages you had in living, where you lived etc number 1 being the lowest and getting absolutely nothing and number 7 getting more than you need . Aimee took on the theme that alot of Classical novels convey of Society Structure and how that determined on what you were in life, but a little twist. Our Main protagonist is has taken her test and already marked with the number 3, and let’s just say, that is pretty much next to nothing. I really liked Kitty Doe even though she may not seem that strong, from the outside, she is damn strong from the inside, I don’t know how she survives the whole book with that went on. I felt for her so many times in the book, I just wanted to just give her a big hug. I loved the Plot; it was different, interesting, different. I could never pick what was going to happen next, as there was so many twist and turns and I loved it. I hate when I can predict things that happen in books, it just makes them boring, but in Pawn I thought something was going to happen and then something the totally the opposite took place. I also loved that the book was Fast Paced. At the start some people might have say its slow, but I believe that was the world building and it was done perfectly. I really don’t know why or if it was just me, but I found the first few chapters very emotional, they just really hit me in the gut, the way that Kitty was feeling, the way it was described was like BOOM. I am not that ashamed to say that I did tear up a little, but to why, I really don’t know the answer to that at all. Through the whole book I had no idea who I trusted. Which made it that more interesting. You thought someone was good, or bad. And they did or said something that totally flipped your option on them. Also the whole idea of being ‘masked’ was intriguing and terrifying at the same time. I would never want that done to me or any one I loved and cared about. But I was completely into finding out so much more about it and the big question of why someone would do this. The way that Aimee incorporated this was very smart. I really enjoyed the romance concept in Pawn it wasn’t fully of snappy romance. It was carefully placed throughout the novel. I adore the romance between Kitty and Benjy. It was so cute and I really like going into a YA novel where the couple is already together, they already went through the awkward first stage that, I sometimes really don’t like to read. It was refreshing. Throughout the novel we see there relationship build and go through tough times. I was really concerned when I thought there was going to be a love-triangle, but thankfully there wasn’t one and our main focus relationship wise was on Benjy and Kitty. I really don’t know how I feel about Benjy, I don’t know if I love him or I want to it him and cut him up in pieces. He loved Kitty to his core anyone could see that but it was a little over protective and just made me so angry sometimes. But in saying that I wish I had a boyfriend like Benjy, whom is so sweet and caring. I also really like the theme of family vs power again it was very intriguing. The idea that being corrupt by power can make you turn on anyone even your own family. I can whole heartily say that Pawn by Aimee Carter is one of my favourite books on 2013. From the writing style, characters to the story it’s self it wrapped me into the world and I cannot wait to pick up the next book the Blackcoat Rebellion. And I don’t mind paying money to get a physical copy of it either.